I’m not saying this is what Jack was all about. This is the Jack that I saw, in the last few years of his life. He was unwell and worried about the future and he got rather ill tempered. But would you believe, after all that, Jack was actually a tender, caring man? Would you believe he was a Santa Clause of kindness? That he was a teddy bear with the volume up to high? He and his fellow Beat writers, more than merely writing and painting and making music, also showed people how to take back ownership of their lives. I remember when I first saw Jack several years ago at another bookstore. He was sitting on their couch and going on about how great he was, how his writing was the genuine article and what everyone else was writing was crap. (Except Saroyan, Algren, Bukowski and a very few others.) He complained that some books he’d tried to sell over in Berkeley, he couldn’t unload. His face, with the missing teeth looked like it had a flat tire. His pants looked like he’d pissed himself. He was so loud! Did he just sit on that bookstore’s couch all day and broadcast? If that was a full-time poet, I’d rather think about sweeping streets. That was my first impression. Who cares if Jack Kerouac wrote a half page introduction to his first thin pamphlet of poems? So what? I saw him several more times, then I heard he was going to do a reading at the Mission Cultural Center. I thought, what the hell, I’ll go out and see him. At the reading most the chairs were filled. Filled! I was surprised. Where did everyone come from? I noticed many younger people and this amazingly pretty woman in the first row, part gypsy, part princess. Stunning. I didn’t expect that either. I don’t know what I expected—gray toothless men taking a break from AA meetings? I had no idea. Jack got up; he had on a silk pink shirt, a blazing red scarf and his floppy purple hat. His pants were half falling down and filthy. He thanked everyone for coming. I’ll never get this on paper. I’ll never do it justice. But there are people who look ordinary as hell and you think they couldn’t hold down their side of a bus bench, but then they get up before you, do their thing, and it’s sensational! He read poems about remaining a free spirit. He hollered, wailed, cooed, sang, ranted like a rusty drum. He read a poem about flowers and prostitutes and a couple of poems for old friends, cheated and gone. He described sweet souls caught at the bottom in life’s meat grinder. He had poems for sad, lonely, locked out people. Everyone at the reading loved his poems. They loved Jack. What a original! Some of them were old friends. I don’t know what I expected, but there he was, putting everything he had into it. Shouting, wooing, singing, playing the harmonica, dropping lines, apologizing, then going on, his glasses slipping down his nose, waving his arms about, being a clown, a dirty old man, a preacher, a social misfit full of hugs and kisses for everyone, enemies included. A poet. After the reading, people clapped with enthusiasm. A couple of people were taking pictures. On a more personal level, I didn’t really get to know Jack until the summer of 1995 when I cleared out a small room at the back of the bookstore. One day when Jack came in I asked if I could pay him to paint a few men with hats and other figures on one of the walls of the room Id cleared out. I wanted something colorful. He said, “No problem, sure thing,” and better still he wouldn’t charge me. Buy him a sandwich and the paint. That’s all he wanted. Jack came in a few days later to prepare the wall. The next thing I knew he asked if it would be all right if he used two of the walls. “I’ve been waiting a very long time to do something like this. Very long! Scott, you have no idea!” He started coming in every day and getting to work in the little room. He needed $120 for paint and undercoating which I gave him. Then he said he needed $60 more. He was using only the best quality paint. It wasn’t cheap. We got into sort of a daily pattern. I’d come to work, open the bookstore. Soon Jack would walk in with his coffee, papers, letters, paints, filthy pants and hands all covered with paint. He’d march on to the little room and start to work. Then I’d hear his coughing and swearing. He’d smoke. I’d hear him dragging the aluminum ladder around. He made a lot of noise. He often came up front and said how his entire life he’d been ignored by the major publishers but they’d discover him when he was dead. He said he was too honest. They weren’t ready for an outlaw like him. Then after one or two hours he’d quit. Every few days he’d ask for more money. The good news was that Jack had decided he needed the two remaining walls and he started to work on them. I’d pass through his painted room to use the bathroom and he’d be intently at work, usually applying the paint right from tubes to his fingers then onto the wall. He filled the walls with brilliant figures, faces, cats or horses, and words. It was marvelous. Especially when the afternoon sun filled the room. He reworked parts which he didn’t like. He was a hard worker. He’d curse and cough and bang around with the ladder. He’d smoke. He listened to Classical or Jazz on a small tape player he plugged in. He regularly came up front and asked to use the phone. He frequently introduced people to me and to the store. One day he put a thick manila envelope on the front desk. Jack went on back to his painted poem room. I sat waiting for customers and I settled down to read. This work he’d handed me was quite good. It was a lyrical social protest in the form of a series of clear pictures of working people and their struggles. It reminded me of John Steinbeck and Dorothea Lange. I remember thinking at the time that it would be a tragic thing if this work never got published. Week after week, Jack kept coming back to work on the room. He had so much energy. He painted the north wall specially for children. On the south wall he painted the one armed piano player and painter Ed Balchowsky and copied a poem he’d written about him. It didn’t seem to matter what was going on, Jack came back day after day. Sometimes he’d sit for long spells looking at what he’d done. Over the five weeks he’d tell me little things about himself. He mentioned his son and his wonderful grand daughter. He was so proud of his grand daughter. He’d also talk about when he organized labor in the south in very black areas where other organizers were afraid to go. He’d been to Mexico City to paint. Franz Kline had given him $1,000 to start out. He painted down there in Mexico City right out in the open. They thought he was crazy. He traveled to Spain. Elsewhere. Mostly during those six weeks (and more than $800 in paints and sandwiches) I saw how Jack’s persistence day after day resulted in something greater than the parts, something magnificent. He did one “brick” at a time. He didn’t make excuses. He made sure it was the best “brick” he could do. The best. Then the next day he’d worry about another “brick,” and so on. Jack was a living example of how to get work done. 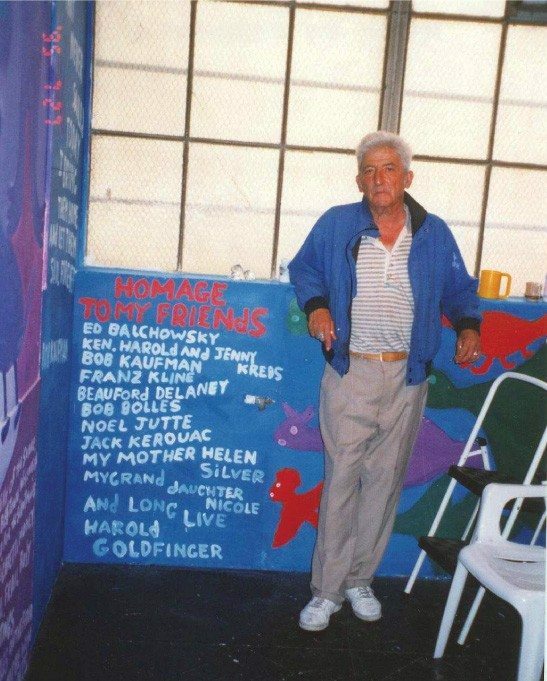 Jack finished the painted poem room in July of 1995 and we had a special Jack Micheline event at the store to celebrate. He invited all the people he believed in to participate. He filled the place. After he completed his poem room, he’d gotten so much into the habit of coming over from the Curtis Hotel (which was down Valencia and across the street from the bookstore) that he started coming in and going to the back to sit daily. He brought all kinds of people in to see his mural, his painted poem room. Sometimes he’d sit up near the front desk on the black couch. I saw him day after day. He’d be peddling books and complaining how another bookstore had backed out of printing his book, “Don’t Eat Red Meat on a Hot Day.” He complained about the printer across the street that was going to bring a book of his out but the printer went out of business. 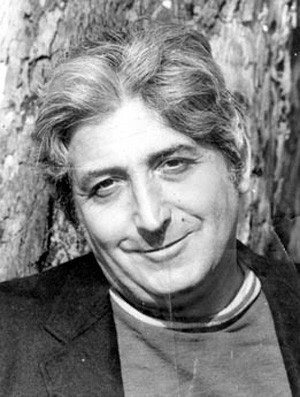 He loved the work Matt Gonzalez was doing to put together a book of selected poems (“Sixty-seven Poems for Downtrodden Saints,” FMSBW Press, San Francisco). When that book did come out Jack even found a young guy out on the street to take copies to New York. Jack specially inscribed several copies to friends in New York. Once Jack told me about the women he’d write to in prison. He exchanged some steamy letters. He sent money to one woman who promised to visit him when she got out. She never did. His luck in all departments, including going to the track, seemed to be consistently awful. (But this didn’t keep him from being an optimist and betting on the long shots.) He didn’t want anyone’s pity but I just couldn’t help but feel bad for him. He went to New York for a Beat conference. He went to Denver. He visited a friend that owned a beautiful farm. He came back crusty as ever. Restless, restless always on the move. He wanted to move, for good, out of San Francisco. He wanted to go out into the country, with trees and nature and relax. He kept saying he’d been screwed his whole life and they’d discover him after he was dead. Nobody had any idea how good he really was. The day before he died he looked no different from on any other day. He was restless as ever. I’d just returned from a trip to LA. He said, “Be well,” as he went out the front door that night. He headed on down the street to who knows where. I’d seen him cross the street right through traffic with big manila envelopes under his arm, so many times. It was the next afternoon that someone from the Curtis Hotel came over and asked, if I heard? They’d found Jack Micheline dead on BART. “No” I answered. I hadn’t heard. The morning after his death I put a candle and some flowers in the window. One of his friends, Julia, came in and we stood in a state of speechless grief. She said, “Well I hope someone will do some sort of service for him. Something fitting for Jack.” I said, I didn’t know. His son might just come to settle things and to take his remains. Then Julia said she knew someone who had a former church building, so next thing I know, Julia and the tireless video chronicler, Kush, met in my store and started making plans. Hundreds of people came. (People had been informed of the event entirely by word-of-mouth.) Julia showed me the food Puerto Alegre, Katz Bagels, and other local restaurants had donated. A television monitor was playing clips of past readings. There was Jack, lively as ever. The room was filled with the Who’s Who of San Francisco alternative press (as opposed to commercial) literary history. Among them all, John Bryan, former publisher of the legendary “Open City,” which first carried Charles Bukowski’s famous weekly column, “Notes of A Dirty Old Man,” the young publisher Johnny Brewton, creator of “X-Ray Magazine,” Allen Cohen, the originator of the quintessential freedom psychedelic newspaper of the 1960’s, “The Oracle,” A.D. Winans, close friend of Jack’s and publisher of two of his books. The place was full of such people. Then upstairs in the big room under the watchful eyes of Jack himself (rendered in a giant spirited portrait of him) the speakers began paying tribute: Harold Norse, Neeli Cherkovski, Michael McClure and Jack Hirschman who electrified the audience with a thundering good poem that brought everyone to their feet cheering and clapping. There were musicians who wailed out sad tunes and the owner of an art gallery who’d put on a one man show for Jack. In the audience was Eileen Kaufman (widow of Bob Kaufman), so frail, swaying her head back and forth, seemingly caught between smiling and crying. George Tirado, the big man got up on the stage, a street poet himself. He belted out a howling beautiful lament for his lost friend Jack and the hard life street poets live. Ken Kesey and Lawrence Ferlinghetti sent messages of sympathy, which were read. The program for Jack Micheline began at eight and speakers and poets went on till near one in the morning. Of all the people who climbed those stairs and stood before the audience, what touched me the most, was when Jack Micheline’s only child, his son Vince, stood on the stage with Nicole, Jack’s grand daughter in his arms, and gave a warm, humble, heart-felt thank-you to everyone for the love and kind words to his father. Nicole leaned over and said thank you into the microphone in her small child confident, Jack-Micheline-like voice. When I left to walk home I felt torn. To see such a grounds well of support was so moving, but I also felt so broken with sadness. Jack was gone. If only he could have been there to see it all.